Our company has been providing quality sheet metal Thunderbird repair panels for over 38 years. The company is owned by Bob and David Jones. David and I started making sheet metal parts in 1972 when we worked on our first 1955 Thunderbird with our father. We found a need for sheet metal parts for these cars and we started a business called Bob's Auto Body. This was located in Akron, Ohio, where we started producing a quality line of sheet metal for 1955-1957 Thunderbirds. In 1979 our father moved the business to Merritt Island, Florida, where he renamed it Thunderbird Enterprises. I remained in Akron and started my own business called "Classic Sheet Metal". 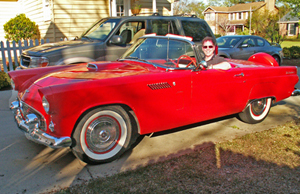 My first car was a 1963 Thunderbird Convertible, which I bought for $300.00. It needed a lot of work and I used the skills I learned with my dad making small bird parts to produce sheet metal products for the big birds. We moved the business to Charlotte, NC in 1982 and my brother David joined me there. Our father passed away in 1989 and Dave and I were able to purchase, "Yes Purchase" some of the equipment and dies we helped make in our youth and re-included the 1955-1957 bird parts into our catalog. We have expanded our line of parts to include all the birds from 1955 through 1971. We have recently expanded into 1963 and 1966 Galaxies. We continue to add new parts to our catalog, so if you don't see it, please ask.